Hi! 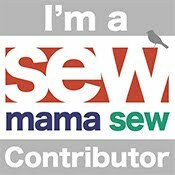 I'm Meriel, mother of three, blogger, and sewist! I also run a small Facebook page, which I intend to grow into a small business in the future. I've been sewing for three and a half years, blogging for almost the same length of time - but this is the first blog that's really taken off, thanks to some amazing Facebook groups! The internet is so useful and wonderful! I don't love: rethreading my serger, changing out my needles and trying to remember which ones are still good, trying to destash fabric, and being told I "have enough patterns already, hoarder".